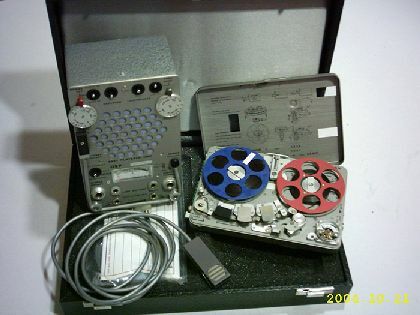 This is the famous NAGRA SN, the smallest professional tape recorder in high-quality, in the world. This machine ordered by the killed president Kennedy from Stephan Kudelski. Probably, Kudelski couldn't presume, that his machine will the most prosperous spy-recorder in professional quality. It has made with 3 tape speed, between 2,4 cm/s- 19,05 cm/s. The fastest tape speed can be used for the studios.